Renovation and modernisation (R&M) of hydropower projects is a cost-effective way of bridging the gap between demand and supply of power. The life expectancy of a hydropower station depends largely on its service conditions. Normally, the operational life of a hydroelectric project (HEP) is 30 to 35 years. Due to prolonged operations, the generation capacity of an HEP reduces, thus calling for revival on a periodic basis. Renovation, modernisation, life extension and uprating can help in dealing with technological obsolescence, restoring lost capacity, and improving the availability, performance, reliability and efficiency of the plant. The Central Electricity Authority (CEA) has a dedicated hydro wing that identifies various R&M schemes, examines technical and financial proposals and monitors R&M works. The division also provides design and engineering consultancy to HEPs. R&M requires technical, financial, commercial and regulatory support. The technical aspects of hydro plant R&M include an in-depth study of residual life assessment, finalisation of the scope and a detailed report on the specific parts that need attention and refurbishment to enhance the productivity of the plant. On the basis of this inspection, a detailed project report (DPR) is made and experienced vendors who can provide the services are sought. Further, financial parameters like internal rate of return, net present value and benefit-cost ratio are calculated to determine the viability of the R&M project. Based on the strength of the project, financial institutions take a call on the funding. 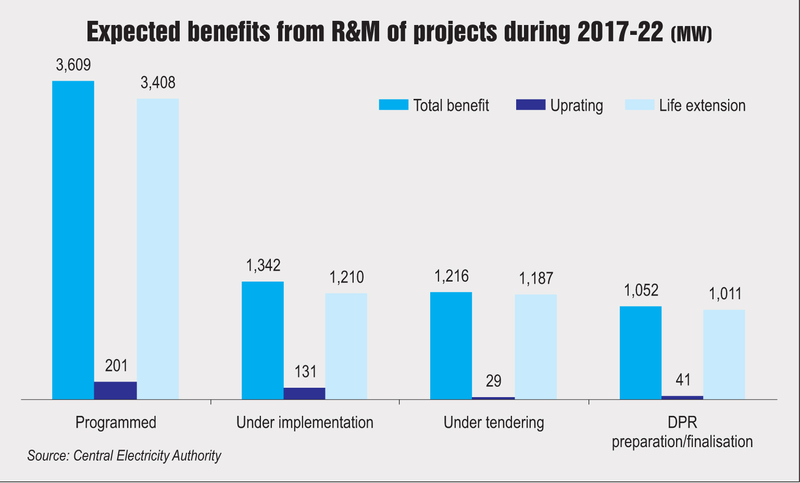 During the Twelfth Plan period (2012-17), a total of 20 R&M projects (two in the central sector and 18 in the state sector) with an installed capacity of 4,014 MW have been completed so far. A total expenditure of Rs 10.49 billion was incurred in upgrading 534 MW of capacity, which covered 476 MW under life extension, 15 MW under restoration and 43 MW under uprating. Three projects in the state sector are still in the implementation stage, and are expected to yield a life extension benefit of 32 MW of capacity. Going forward, the government has planned a total of 52 (eight central and 44 state) projects with a combined capacity of 9,288 MW for R&M during the period 2017-22. The total expected outlay for these projects is Rs 59 billion. Of these, 13 projects (four in the central sector and nine in the state sector) with capacity of 3,826 MW are at the implementation stage. Another 16 projects (two in the central sector and 14 in the state sector) with 3,035 MW of capacity are under tendering. While DPRs are under preparation or finalisation for another 13 projects (two in the central and 11 in the state sector) aggregating 1,191 MW of capacity, residual life assessment studies are being carried out for 10 projects totaling to a capacity of 1,235 MW in the state sector. An expenditure of Rs 6.08 billion has been incurred so far on these projects. To achieve the desired results, R&M schemes need to be identified by utilities in good time. Taking into consideration the need for R&M of projects, an appropriate programme needs to be developed. Also, resourceful and competent executing agencies are important for the successful completion of R&M schemes. This requires work to be optimally designed for implementation in terms of contract packages, so as to get the best executing agency at the least cost. Proper financial support, timely tie-ups with the concerned agencies, approvals and clearances from the concerned authorities are imperative. A good DPR is a prerequisite for the proper implementation of the programme. However, limited agencies are available to provide the same. Utilities, therefore, need to take care of this aspect while devising their R&M programmes. In addition, close monitoring of erection and commissioning is required. Also, the availability of generating units shutdowns need to be planned and coordinated for early and timely completion of work.